A new study led by the University of Adelaide but involving scientists from a number of universities including Bristol University and the University of Southampton has mapped the evolution of meat-eating dinosaurs and identified how these large creatures gave rise to the birds (Aves). The Theropoda, or at least parts of this meat-eating dinosaur group kept shrinking in size for at least fifty million years before the evolution of Archaeopteryx. Archaeopteryx may not have been the first bird, but the dozen or so fossils of this enigmatic dino-bird, all of which come from Germany, provide evidence of a transitional creature that shows anatomical features of both dinosaurs and birds. Most scientists now accept that birds are descended from the dinosaurs, one particular group of meat-eating dinosaurs called the Maniraptora. Dinosaurs in the family Dromaeosauridae, fearsome, aggressive predators such as Velociraptor (V. mongoliensis) are members of the Maniraptora clade, but over what time period did the evolutionary changes take place to result in a small bird from larger Dinosaurian ancestors? Sustained miniaturisation gave rise to the birds. The international research team, led by Associate Professor Michael Lee (School of Earth and Environmental Sciences, Adelaide University), including Gareth Dyke and Darren Naish (both from the University of Southampton) and Andrea Cau (from the University of Bologna and Museo Geologico Giovanni Capellini), have published their work in the latest edition of the academic journal “Science”. Professor Michael Benton (Bristol University) provides an adjunct to this research “How Birds Became Birds”. In professor Benton’s perspective he explains the importance of this new study by placing it into the context of existing research into Theropoda evolution. Professor Benton states that although it is now widely accepted that the birds evolved from a particular branch of the dinosaur family tree, it is not certain how quickly this evolutionary transition took place. One of the first birds known from the fossil record (A. lithographica) from the Upper Jurassic of Germany, was thought to have evolved its wings, feathers and the ability to fly within just ten million years or so. However, over the last two decades, scientists have been able to trace the thirty or so characteristics that distinguished the small, Archaeopteryx with its aerial abilities from its larger, ground-dwelling dinosaur ancestors back through the Theropoda. This new study reinforces the thinking that the anatomical changes needed to convert a terrestrial predator into an agile, creature capable of powered flight began to emerge much earlier in this group of meat-eating dinosaurs. 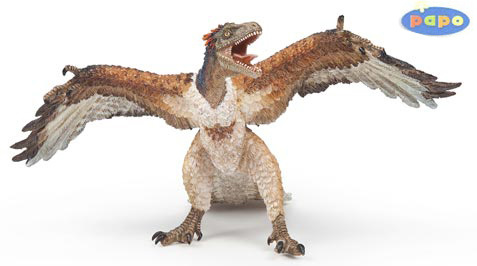 New from Papo for 2014 a model of Archaeopteryx. How much earlier? This new work suggests that changes began to take place in the Theropoda at least fifty million years before Archaeopteryx. This means that as far back as 200 million years ago, at the beginning of the Jurassic, evolutionary changes in meat-eating dinosaurs were beginning to occur that would eventually lead to today’s birds. The team used a complex mathematical modelling technique more associated with the study of the geographical spread and evolution of viruses to assess the changes in the skeletons of Theropod dinosaurs. In total 1549 skeletal, anatomical characteristics were mapped from over 120 specimens of Theropod dinosaurs and birds. Two main drivers leading to the transition of dinosaurs into birds were identified. The group of Theropod dinosaurs directly related to the birds undergoes sustained miniaturisation across fifty million years. Average body weights are gradually reduced from around 160 kilogrammes in Early Jurassic direct Theropod ancestors to the very light Archaeopteryx, estimated to have weighed less than one kilogramme. Secondly, this particular group of dinosaurs seems to have been evolving skeletal adaptations such as feathers and wishbones up to four times faster than other types of dinosaur. “This highly informative new research, has applied a sophisticated mathematical model to help unravel the evolutionary relationship between the birds and their dinosaur ancestors. Instead of thinking about dinosaur/bird evolution as a quick leap into the air derived from a relatively small component of the Dinosauria, it seems like dinosaur/bird evolution is more akin to a long runway leading to an eventual take off”. The distinct and prolonged miniaturisation of the Theropod/bird stem across tens of millions of years would have facilitated the evolution of many unique characteristics associated with smaller body size. This would have permitted these dinosaurs to exploit a variety of different ecological niches which their larger cousins could not. Small size also infers a more agile lifestyle, faster reactions, sharper senses – steps towards the evolution of enhanced balance, large eyes and more sophisticated brains that could eventually manage the complex body movements required to coordinate powered flight. Maniraptora evolving faster than other types of dinosaur. Associate Professor Michael Lee, the lead author on the mapping of this part of the Dinosauria family tree commented that the branch of the Theropoda that gave rise to the Aves was the only group of dinosaurs that kept getting smaller. It can be argued that these evolutionary characteristics, miniaturisation and more rapid anatomical adaptations were the reasons for the survival of the birds at the end of the Cretaceous. So why were a group of Theropod dinosaurs able to evolve quicker than other types of dinosaurs. We may have to look at bird-hipped dinosaurs for an answer. As far as we know, the lizard-hipped Theropod dinosaurs were the only meat-eating dinosaur group. The bird-hipped members of the Dinosauria (Ornithischians) were all plant-eaters. Their hips evolved in a different direction (literally) to the Saurischians (lizard-hipped forms). The pubis bone got pushed backwards, purportedly to accommodate a larger gut to help digest all that tough plant material. A big gut meant a bigger body, so part of the Theropoda, the allosaurids for example, evolved bigger and bigger forms so that they could hunt and kill the herbivores which themselves were getting bigger and bigger. Classifying dinosaurs by the shape of their hip bones. As Associate Professor Lee points out, the Theropod dinosaurs were the only group to continually push the envelope when it came to size of their skeletons. It is possible that the herbivorous dinosaurs simply could not shrink, since a plant-based diet requires a larger gut for digestion. In the meantime, the Theropoda could explore alternate resources, habitats and even prey. All of these new activities, such as chasing insects, climbing trees and gliding would in turn, have led to other novel anatomical adaptations. There is one further, rather intriguing point to be made when the consequences of this research are considered. If miniaturisation in a branch of the Theropod dinosaurs began as far back as the Early Jurassic around 200 million years ago, could the ultimate driver for these changes have been the Triassic/Jurassic extinction event that marked the demise of a very large number of terrestrial Archosaur groups?